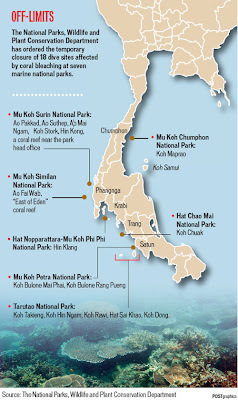 After a couple of days with conflicting information coming from the Thai government and especially the National Parks, Wildlife and Plant Conservation Department and it's chief Sunan Arunnoparat in which closures of complete parks for an indefinite time were announced, the current situation of 18 closed dive sites was announced as posted in the Bangkok Post today. Initial reports and announcement made by the Khun Sunan's department named divers as the culprit of the current coral bleaching. Something hard to defend since year long research points to a combination of factors, amongst which elevated water temperatures have a high impact. Divers most certainly have an impact on world wide coral reefs but coral bleaching is something I find difficult to blame divers for. My first reports on coral bleaching on this blog originate from May and July last year, mentioning and showing pictures of personally recorded bleaching on Chaweng Beach and around Koh Tao. It turns out that hard coral (like stag horn) is hit the hardest and the soft coral is a lot less affected. Out of own observation, the bleaching in the Gulf doesn't seem as bad as compared to the Andaman Sea, especially the Similan Islands have some hard hit areas. 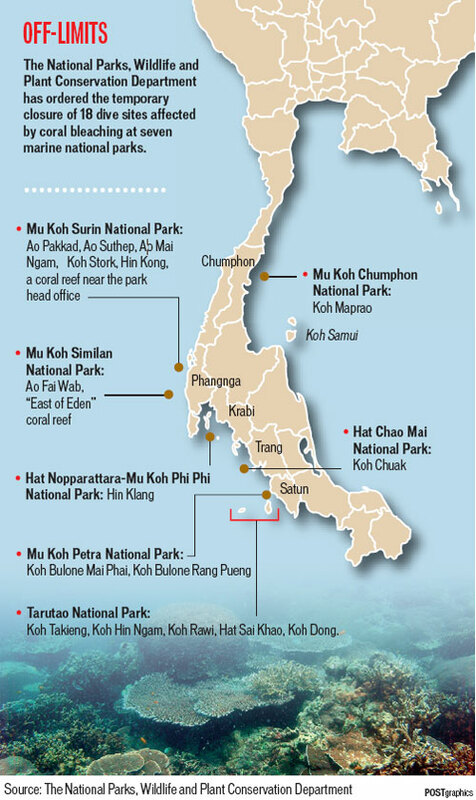 The general consensus and an accepted fact is among divers that closing down Marine Parks for divers will give a free reign to illegal fishing practices by Thai and Chinese fishing boats which will lead to even more coral reef destruction since they can do whatever they want, without the dive boats being able to see and report illegal fishing activities. Some very interesting threads are going on on Thaivisa and Scubaboard. The last word won't be said or written about this topic, stay tuned for more updates.